Time for the weekly edition of Blogger Candidate Forum. Before we get going on the Dodd-Frank Financial Reforms, a shout out to Housing and Urban Development Secretary Ben Carson. According to the good doctor, "low-income Americans should have access to affordable housing-just nothing too 'comfortable.'" (http://www.thinkprogress.org; date accessed May 3, 2017) This clueless comment came last-week, during a tour of facilities for low-income residents in Ohio. Expanding on this empty headed comment, Dr. Carson told the New York Times, "...compassion means not giving people a comfortable setting that would make somebody want say: I'll just stay here. They will take care me..." This tone deaf comment was uttered right after the head of a supportive housing center for recovering addicts. Apparently, the good doctor has not figured out that research shows that providing housing is a viable way to reduce homelessness. Insert eye roll. Alright, onto Dodd-Frank Financial Reform. Shortly after meeting with Wall Street executives in February, President Donald Trump signed an order to begin dismantling the Dodd-Frank Financial Reform, enacted after financial crisis to prevent the same thing from happening again. Kriston Capps writes in his CityLab article, "Trump Can Now Re-Create the Housing Crisis That Got Him Elected," The end of Dodd-Frank could return the nation's financial system to the Wild West days that prevailed before 2008-the the lending environment that precipitated the Great Recession." The irony of POTUS's action is during the campaign, he castigate Wall Street actors at the epicenter of the foreclosures crisis. He even went as far as to call JP Morgan Chase CEO Jamie Dimon the worst banker in the United States. Now ensconced in the Oval Office, POTUS invited the worst banker in the U.S. to join his circle of Wall Street confidants. 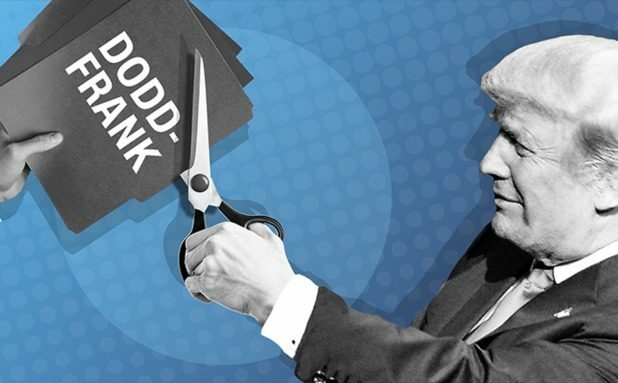 Let us face facts, POTUS did promise to dismantle Dodd-Frank right from the start of his campaign. As Mr. Capps points out, "So the greater irony here is that by sweeping away banking regulations, Trump promises to punish his core supporters. The same same supporters who, in part, voted him into the Whites because they are still suffering from the foreclosure crisis." One of the lingering mysteries of the 2016 presidential election is how in the world POTUS won on a message firmly grounded on jobs when the economy was bubbling at near full-employment levels. The excelsior jobs report (http://www.nytimes.com), released on February 3, 2017 is "a reminder of the continued resiliency of the recovery begun under the Obama administration." 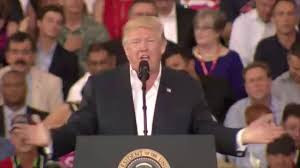 You can say that POTUS's appeal to white identity politics, Federal Bureau of Investigation director James Comey's nausea-inducing October surprise, Russian interference in the elections but you cannot say that unemployment was a reason. 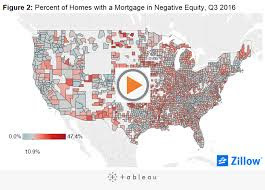 "Percent of Home with a Mortgage in Negative Equity, Q3 2016"
Mr. Capps writes, "Another valid explanation for President Trump is to plumb the profound depths of the housing crisis." 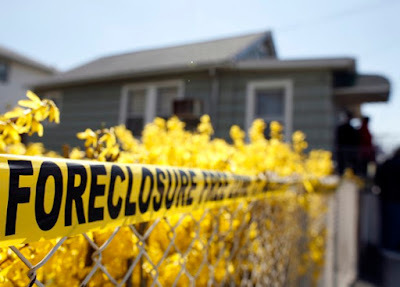 Although the new financial protections helped restore jobs and lending, recovering equity lost to the foreclosure crisis has not kept pace. "As of December, more than 10 percent of homeowners in the U.S. are still underwater on their mortgages, according Zillow's most recent negative reports. The good news is that this number is substantially down from 2012, "when nearly 16 million homeowners-comprising 31.4 percent of homes-owed more than the homes were worth." The situation has improved for homeowners since that grim peak, "but the benefit is both limited and localized. More than one-quarter of homeowners (26 percent) have less than 20 percent equity in their homes, meaning they have not hit the break-even point whee they are not long required to pay private mortgage insurance premiums. Their equity is effectively negative." Thus, negative equity is an instrument of the national economy that has enormous impact on local housing markets. For example, Phoenix, Las Vegas, and Miami, which amply indulged in the excesses that led up to the housing crisis, typified the cities that experienced great losses in equity early into the crosses. However, once recovery was underway; homes and housing markets recouped their value, pockets of negative equity shifted northward from the Southwest and Southeast to the Midwest and Rust Belt. 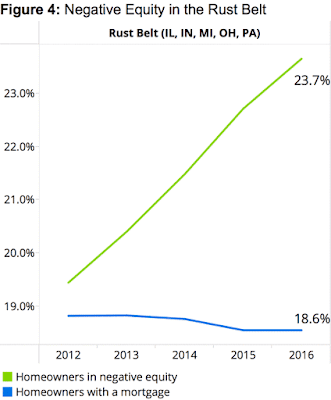 Kriston Capps observes, "Nothing about the recovery spurred negative equity in Michigan, Ohio, Indiana, and other Rust Belt states per se." However, this is not the best way to approach it. Instead, the United States suffered from a massive housing crisis in places that grew at an sharp and unsustainable pace. These cities-i.e. Phoenix and Phoenix-rebounded quickly. Regions that were already in the throes of long-term structural hardships-i.e. 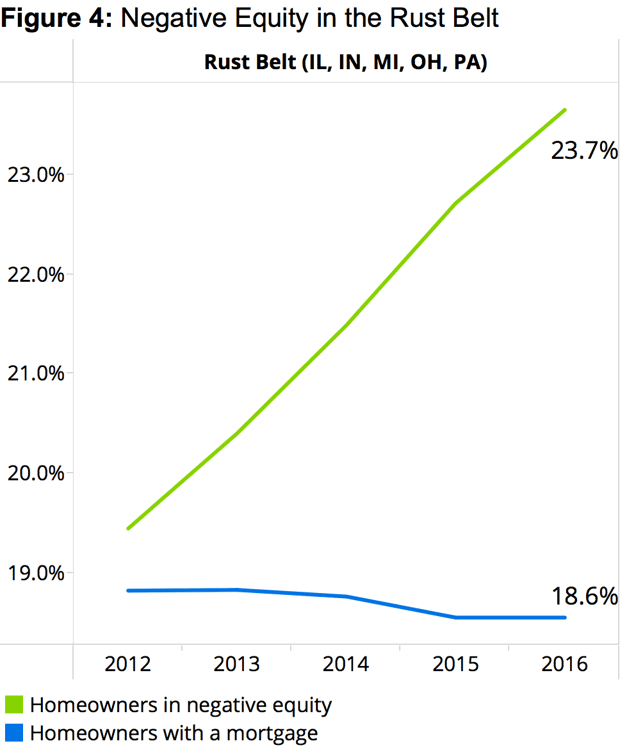 the Midwest and Rust Belt-got knocked down harder than before. Therefore, voters in the those states chose President Trump for somewhat unclear economic reasons, but their feelings of dissatisfaction were not incorrect. As a reward for their efforts, POTUS gave Wall Street free rein again, thus "opening up the possibility of another financial crisis down the road." Mr. Capps notes that Treasury Secretary Steve Mnuchin profited handsomely from the credit meltdown. Circling back to HUD Secretary Ben Carson's empty-headed comment about providing too comfortable affordable housing to low- and moderate-income individuals and families. A 2010 study by Dr. Carson's cabinet department concluded that family homelessness was on the rise since the Great Recession began (http://www.nbcnews.com; date accessed May 3, 2017). This finding was supported by studies conducted by other organizations, including the National Alliance to End Homelessness which reported an increase in the number of older adults without a permanent place to live. (Ibid) Obviously Secretary Carson failed to do his homework on affordable housing. Kriston Capps writes, "The next disaster may not take the form of mortgage-backed securities (although, why not?). It is, however, likely to set the dial back for the Midwest and the Rust Belt-places where Hillary Clinton earned the ire of voters for merely having a meeting with Wall Street bankers."